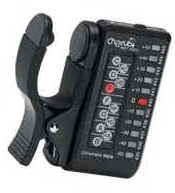 The Cherub Chromatic Mate WST 550C is an inexpensive, easy to use, and accurate digital tuner. Small, portable design lets you take it anywhere! Clips on to the head of your instrument or any part of the instrument. Padded clamps will hold securely to any part of an instrument up to 1" thick. Works by vibration, allowing accurate tuning despite ambient noise! Easy operation with only two control switches: one for power, one for semitone tuning! Auto-detect function displays string number and name of the note! Easy-to-read LED lights show you which way to tune! Auto-off saves your battery if no input is detected for 5 minutes! A4=440Hz - 2032 Cell Battery included free! Dimensions: 1"w x 2 1/4"h x 1/2"d.